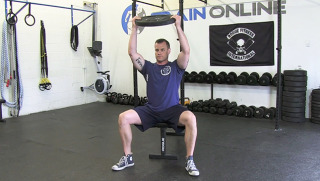 The weight plate front raise is an upper body strength exercise that targets the shoulders. The lateral shuffle on the bench with shoulder press is a beginner compound exercise. This exercise targets the legs and shoulders and is suitable for all fitness levels. 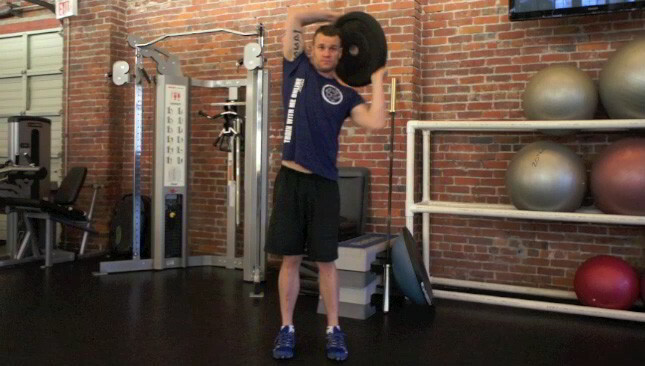 The weight plate trunk twist is a beginner core exercise. This exercise targets the entire core and is suitable for all fitness levels. The trunk twist with the weighted plate is an excellent exercise to warm-up the lower back and core. This is a beginner exercise that can be done by any fitness level. 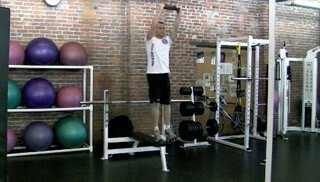 The squat and press with the weighted bar is a beginner compound exercise. The squat and press targets the legs, shoulders, arms and core and is a great warm-up exercise for any program. The around the world is a great shoulder exercise. This exercise targets the anterior, posterior and lateral deltoids in a rotational movement that also strengthens rotator cuff muscles. This exercise works as a great warm-up to any upper body work-out.